The Western Regions in the first century BC. 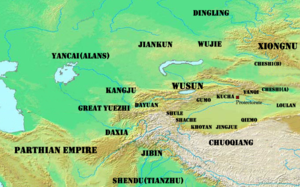 The Western Regions or Xiyu (Hsi-yu; Chinese: 西域; pinyin: Xīyù; Wade–Giles: Hsi1-yü4) was a historical name specified in the Chinese chronicles between the 3rd century BC to the 8th century AD that referred to the regions west of Yumen Pass, most often Central Asia or sometimes more specifically the easternmost portion of it (e.g. Altishahr or the Tarim Basin in southern Xinjiang), though it was sometimes used more generally to refer to other regions to the west of China as well, such as the Indian subcontinent (as in the novel Journey to the West). Because of its strategic location astride the Silk Road, the Western Regions have been historically significant since at least the 3rd century BC. It was the site of the Han–Xiongnu War until 89 AD. In the 7th century, the Tang campaign against the Western Regions led to Chinese control of the region until the An Lushan Rebellion. The region became significant in later centuries as a cultural conduit between East Asia, the Indian subcontinent, the Muslim world and Europe, such as during the period of the Mongol Empire. One of the most significant exports of the Western Regions was Buddhist texts, particularly the Mahayana sutras, which were carried by traders and pilgrim monks to China. The Tang dynasty monk Xuanzang crossed the region on his way to study in India, resulting in the influential Great Tang Records on the Western Regions upon his return to the Tang capital of Chang'an. Before the onset of Turkic migrations, the peoples of the region were Indo-Europeans divided into roughly two linguistic groups, the Saka and the Tocharians. The peoples of oasis city-states of Khotan and Kashgar spoke Saka, one of the Eastern Iranian languages, whereas the people of Kucha and Turfan spoke the Tocharian language. The language of the native people of Loulan has yet to be fully understood or determined. ^ Xavier Tremblay, "The Spread of Buddhism in Serindia: Buddhism Among Iranians, Tocharians and Turks before the 13th Century," in The Spread of Buddhism, eds Ann Heirman and Stephan Peter Bumbacker, Leiden & Boston: Koninklijke Brill, 2007, p. 77, ISBN 978-90-04-15830-6. This page was last edited on 27 February 2019, at 10:51 (UTC).